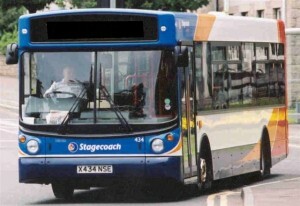 The bus service is provided by Stagecoach route 15 which originates from Perth. The route connects with a variety of rail, coach and other bus services to the north, east and south (connecting in the main through Perth Bus Station). The 15 bus service usually terminates at Comrie but continues beyond to the Loch Lomond National Park terminating at St Fillans 5 times a day (except Sunday). This link covers all Auchterarder & Crieff Area Timetables and is provided by Perth and Kinross Council(external link). There is also a limited Citylink coach service (x2 daily Friday-Monday from June to October) from Perth connecting the Croft with Killin, Crianlarich, the West Highland Railway and Oban. This enables guests to connect to Callander, Fort William and Skye. Comrie (Map(external link)) is just over an hour by road from Glasgow or Edinburgh on the A85 between 4.5 miles beyond Crieff. From the A9 follow signs for the A85 towards Crianlarich. The nearest train stations are Dunblane or Stirling to the South, Perth to the East and Crianlarich to the West In addition to the local and national services there is an overnight sleeper service to and from London.